The rose family includes trees, shrubs, or herbs. The leaves are nearly always alternately arranged, simple or compound, and often bear stipules at the base of the petiole (leafstalk). The flowers are bisexual and actinomorphic (radially symmetric), and have a hypanthium (floral cup) that may be difficult to discern, or be extremely well developed and conspicuous. The flower type/ovary position (relative insertion of flower parts) is most often perigynous with a superior ovary, but in the pome-forming shrubs and trees is epigynous with an inferior ovary. 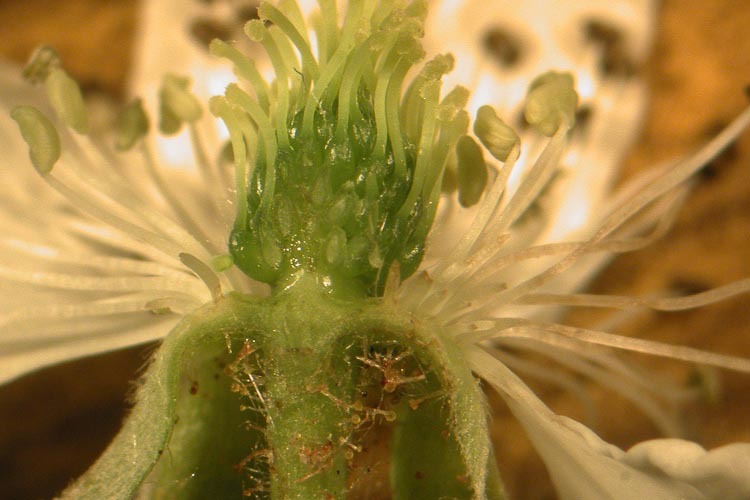 The calyx is composed of 5 fused (connate) sepals. The corolla is of 5 separate petals, arising from the rim of the hypanthium. The androecium consists most often of numerous stamens arranged spirally, but there may be as few as 5-10 stamens. The gynoecium type and fruit type is variable, and form the basis for dividing the rose family into the four subfamilies: (1) “rose” subfamily Rosoideae (perigynous flowers and aggregate single-seeded fruits); (2) “cherry” subfamily Prunoideae (perigynous flowers and fruit a drupe); (3) “pome” subfamily Maloideae/Pomoideae (epigynous flowers and fruit a pome, and; (4) “spiraea” subfamily Spiraeaoideae (perigynous flowers and fruits an aggregate of follicles). The economic impact of the Rose Family is enormous, with large quantities of stone fruits (e.g., cherries, apricots, peaches, plums), pome fruits (apples and pears), and aggregate fruits such as blackberries, loganberries, raspberries and a peculiar “accessory” variety of aggregate fruit –the strawberry). Roses themselves, of course, are favorite garden ornamentals, thanks in part to their elegant fragrance. In Bulgaria, a major perfume industry has grown up around the production of a perfume oil known as attar derived from Damask roses. 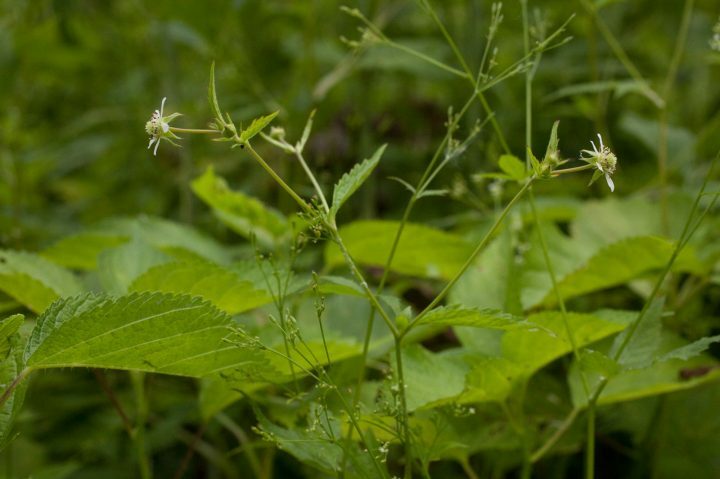 It has been reported that perfume workers rarely develop respiratory disorders, thus suggesting that medicinal properties could be attributed to the plant extracts. 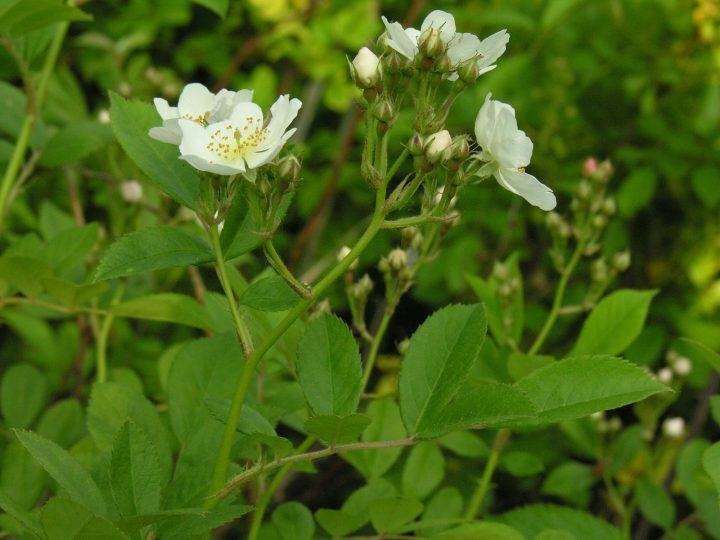 The fruits of wild roses, called hips, are exceptionally rich in vitamin C, with up to 60 times the vitamin C of citrus fruit. 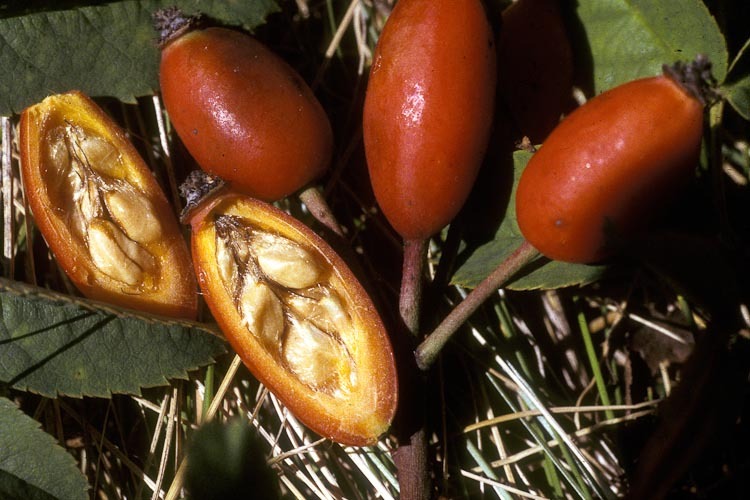 Native Americans included rose hips in their diet, which may be why that scurvy was unknown among them. During World War II, when food supplies became scarce in some European countries, children were kept healthy on diets that included wild rose hips. The hips also contain, in addition to vitamin C, significant amounts of iron, calcium, and phosphorus. (Medicinal information derived from the botany textbook Introduction to Plant Biology, 8th. edition, by Kingsley R. Stern published by McGraw-Hill in 1999). 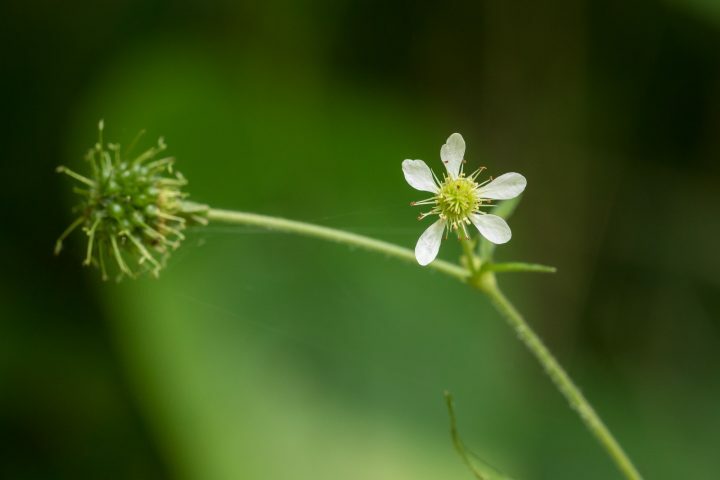 These are the typical “roses,” having flowers with 5 equal-sized and separate petals, a heck of a lot of stamens zipping around in a spiral on an elongate receptacle, along with an apocarpous gynoecium merrily sporting many wee little achenes or whatever. It would sure be easy to mistake a rose (family member), subfam. Rosoidae member for a buttercup. They look a lot alike, don’t they? 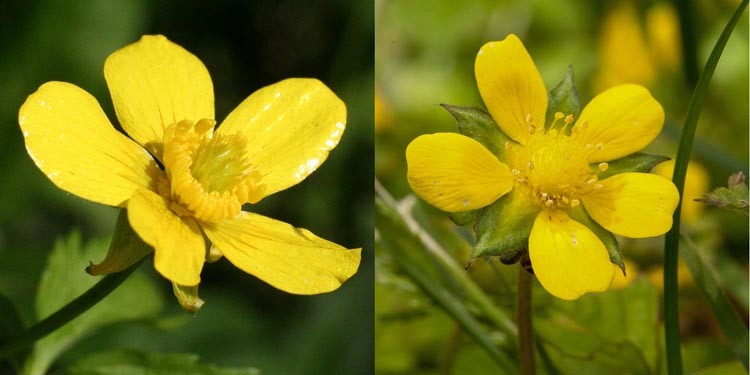 There are two key distinctions, one floral and one vegetative, between the two similar families Rosaceae and Ranunculaceae: (1) the rose family flowers will have a hypanthium (perigynous flower type in this subfamily Rosoideae), whereas the buttercups will be strictly hypogynous and; (2) the leaves of the roses will often bear prominent stipules, a feature lacking in the Ranunculaceae. Below, behold climbing prairie rose. In typical subfamily Rosoidea fashion, the stamens are uber-numerous. Members of the genus Rosa (roses, in the most narrow sense) have numerous carpels surrounded by an extraordinarily prominent hypanthium (floral cup) that closely envelops, in almost bag-like fashion, numerous carpels with a narrow circular opening at the top through which the styles project. The elevated structure we see in the center of the flower below is a bundle of styles extending though the narrow opening. and styles united into a column projecting though the orifice of the hypanthium. 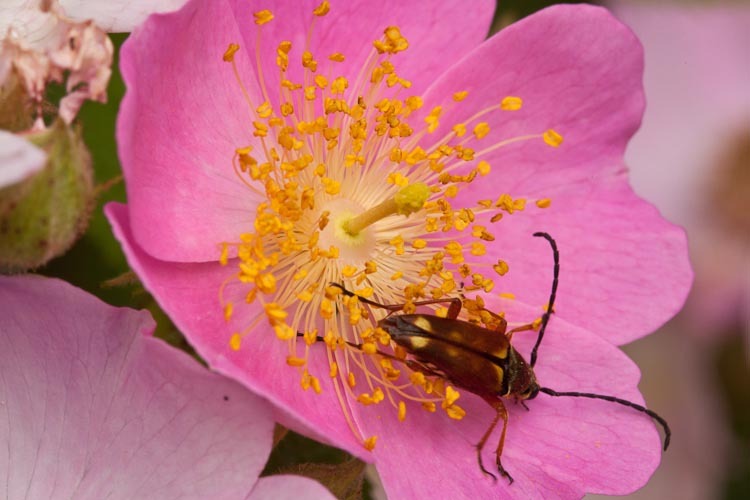 Numerous stamens equates to abundant pollen, so it is no surprise that roses are amply visited by so-called “pollen bees,” in several hymenopteran families that feed their brood pollen. Here’s a video that starts out (and drags on forever almost) with a fly doing some mysterious “sponging-sucking” thing on the rose petals, but then has an exciting finale where a little green bee, incoming, collides with and actually grabs on to the stigmas atop the column of styles (no doubt transferring pollen to the stigmas from previously-visited flowers), and then goes on to gather pollen. Here’s a side-view of a prairie rose flower, before and after (MOUSEOVER) some crazed botanist with a razor blade sliced it longitudinally, ostensibly to afford you a better view of the carpels and all that planty stuff, but actually just to be evil. Bwwahhahhahhah!!! Prairie rose flower just sitting there innocently, minding its own business. Here’s a fully-developed rose “fruit.” Why the parentheses? Because they’re kind of cute, like whiskers on a cat, or a little wink. Awww. Who doesn’t like parentheses? Not only that, but they signify the thing being parenthsized (parenthesized, it’s a word; I saw it on the internet.) (Dude, you just wrote it on the internet; that doesn’t count as “seeing it on the internet.”) is not really what the word usually denotes, in this case (“fruit”), a ripened ovary containing seeds. 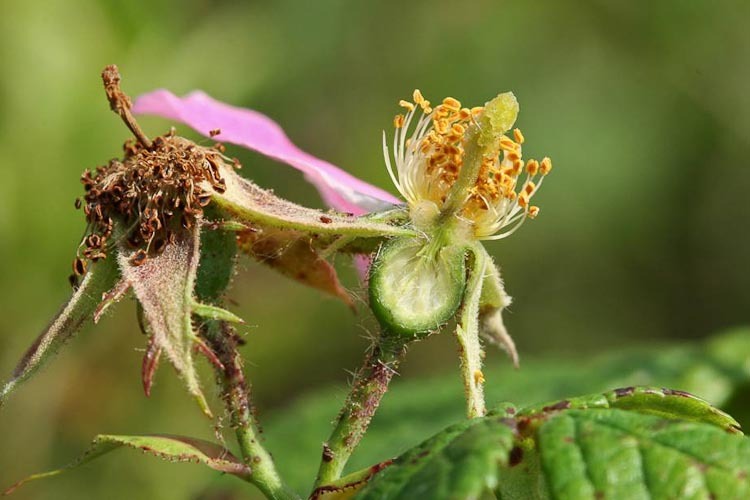 The rose “fruit” is a peculiar composite structure called a “hip,” which is the fleshy hypanthium, in this case the edible part that serves to attract seed-dispersing animals, surrounding several-many dry one-seeded fruits (achenes). The rose hip is a fleshy hypanthium surrounding several-many achenes. Prairie rose also displays that other hallmark of the rose family (most of them anyway), stipules. 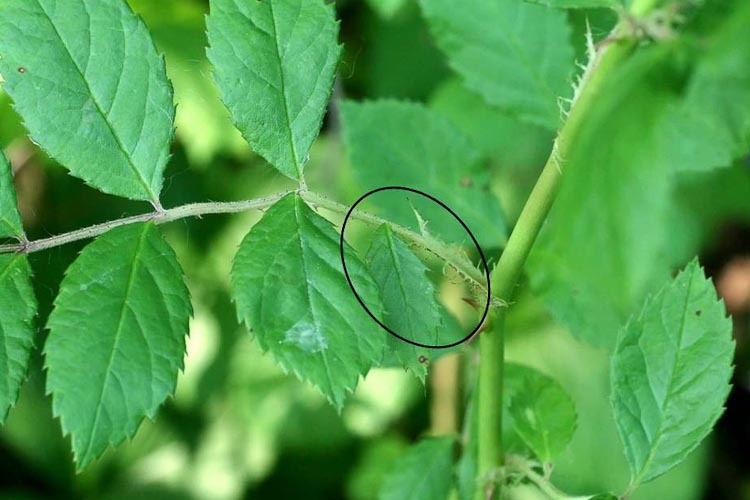 Stipules are small leaflet-like appendages at the base of a petiole (leafstalk). 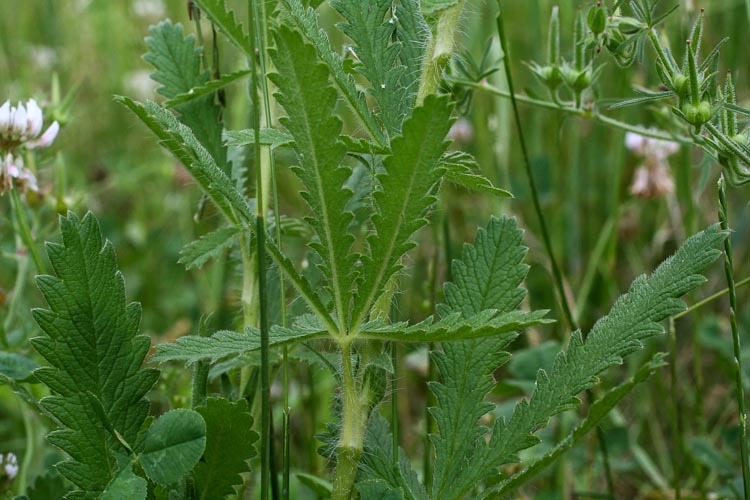 Prairie rose leaves are pinnately compound and bear stipules. Multiflora rose stipules are fimbriate-margined. Several prominent rose family genera are fairly similar to one another in overall form: herbs with stipulate, alternately arranged compound leaves and actinomorphic flowers with 5 separate petals, and numerous spirally arranged stamens and carpels. A good example is the cinquefoil (5-finger) genus Potentilla. 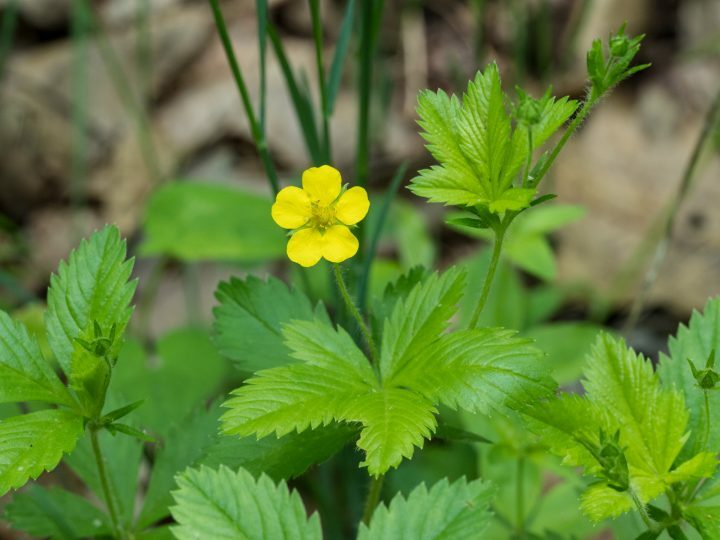 Here’s a little native vine, common cinquefoil, Potentilla simplex, that shows well the palmately compound leaves and flower with an apocarpous gynoecium. 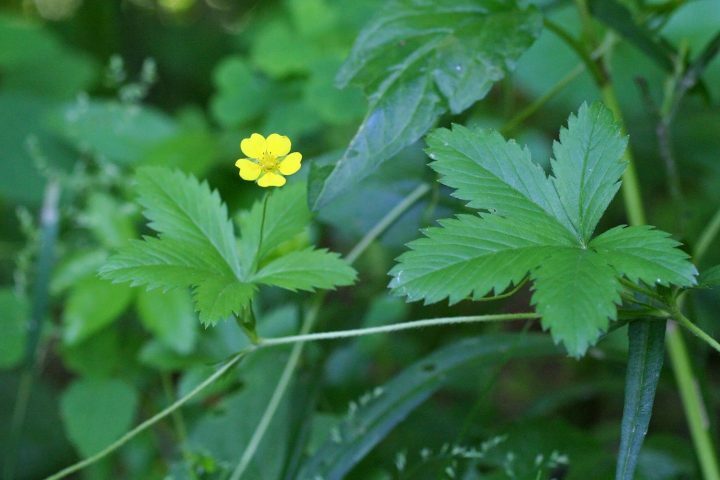 Common cinquefoil is a creeping vine with palmate leaves. Several other cinquefoils are somewhat weedy aliens, such as this rough-fruited cinquefoil, P. recta. 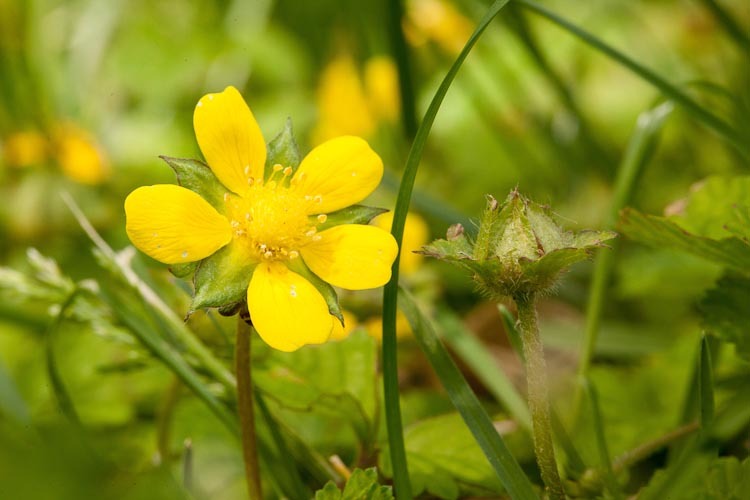 Rough-fruited cinquefoil is a common weed in meadows. Here’s a shrubby (the specific epithet fruticosa indeed means “shrubby”) Potentilla-like member of the Rosoidae subfamily. It’s shrubby cinquefoil, Dasiphora fruticosa, formerly considered to be a Potentilla. 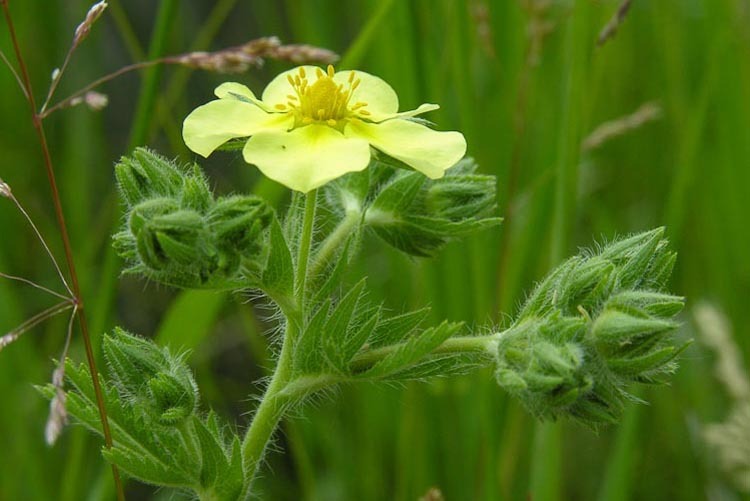 It’s a lovely native that naturally occurs in a specialized habitat: alkaline wetlands called “fens.” The somewhat misnamed “Cedar Bog” in Champaign County is great place to see shrubby cinquefoil and a whole slew (slough?) of other wetland “calciphiles” (i.e., high pH-loving plants). 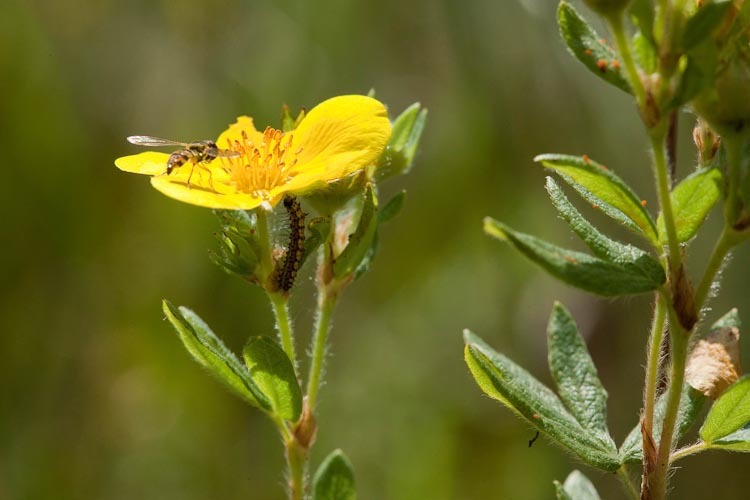 Although its natural occurrence is restricted to special sites, shrubby cinquefoil does well in cultivation, tolerating drought and flowering freely over a long time period. You’ll see it outside fast-food restaurants and other high-traffic areas in cities and towns. Shrubby cinquefoil is a native wetland shrub that is also planted in urban areas. When Potentilla and most other typical members of this rosy subfamily are in fruit, it’s none too exciting. We see just little achenes that fall off the plant, ho hum. But a few other genera really get creative when it comes to seed (fruit) dispersal. Flower-wise, avens in the genus Geum look rather Potentilla-like, but in fruit the styles dramatically elongate, and, as they have sharp little hooked tips, the achenes are admirably adapted for “zoochory,” i.e., dispersal by animals, as “stick-tights.” Here’s spring avens, Geum vernum, showing both a flower and a developing cluster of fruits. 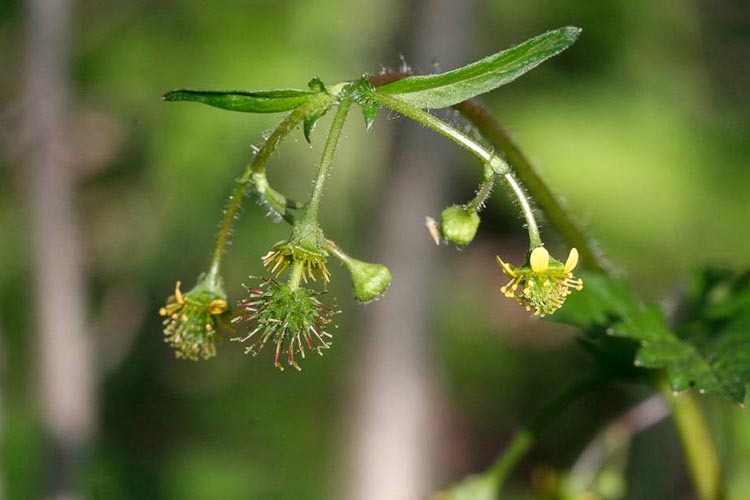 Spring avens (Geum vernum) achenes have long hooked styles that stick to animals passing by. Another avens, common along woodland paths, flowering mid-summer, is whate avens, Geum canadense. White avens, Geum canadense, is a common woodland wildflower. In this closer view of a flower, you can see in the background a young aggregate of the characteristic hooked fruits. White aven, Geum canadense, showing developing aggregate of hooked achenes. 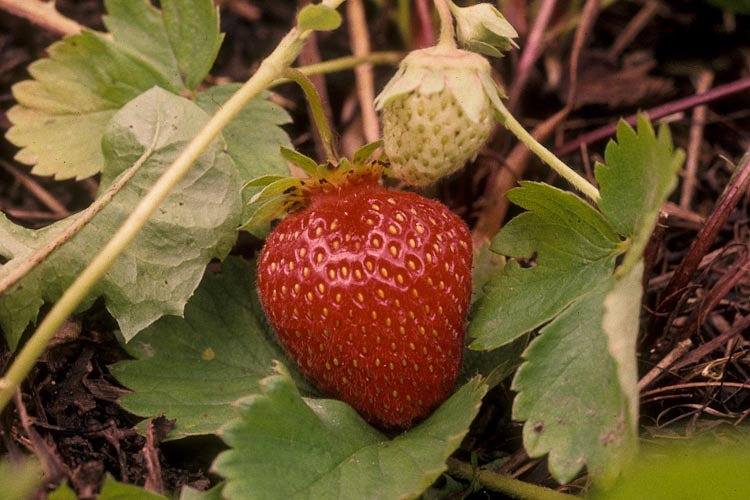 Another stunning distinctively-fruited rosoid rose is the strawberry, Fragaria. In flower, the numerous separate carpels, spirally arranged in an elongate receptacle is “old news” by now. But the “fruit” is like almost no other; it’s an “accessory fruit,” in which the receptacle enlarges and gets all colorful and sweet and everything, and the actual fruits –wee little achenes –are still there, sunken into little pits on the surface of that dome of delicious-ness. 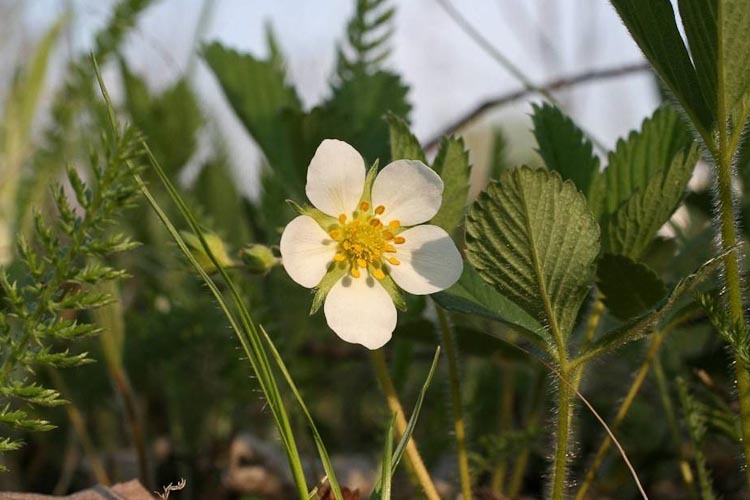 The wild strawberry flower is typical rosy rose. 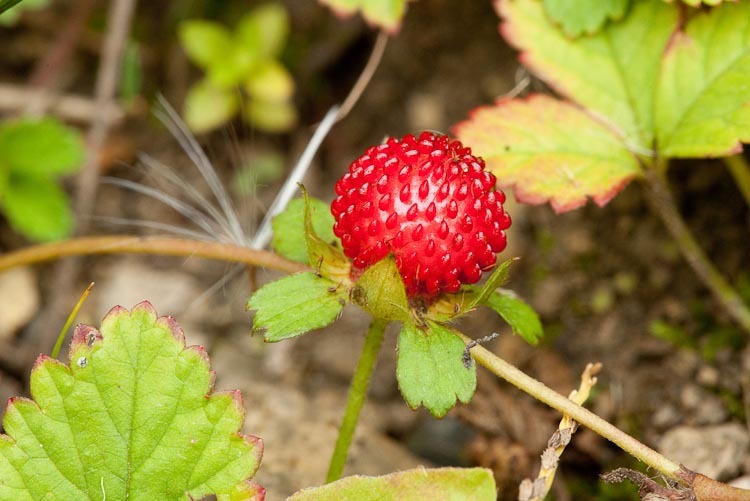 The only other strawberry-like accessory fruit is produced by an Asian weed, Duchesnia indica, barren (or Indian) strawberry. Look for yellow flowers, with large sepal-like bracts alternating with the sepals. 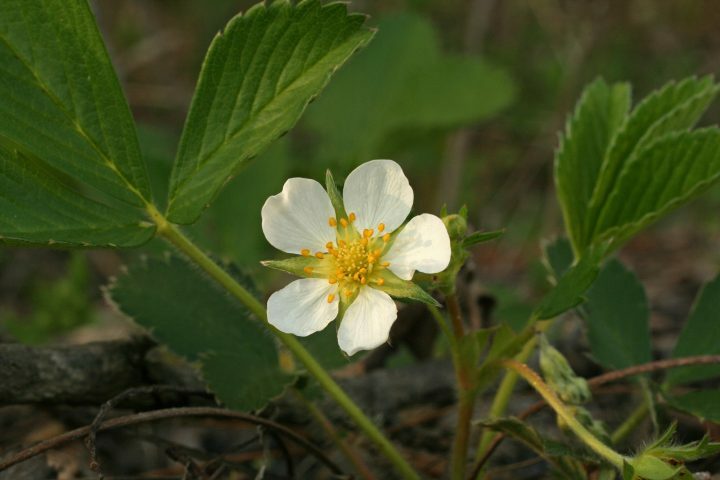 Barren strawberry is a creeping vine with trifoliolate leaves. 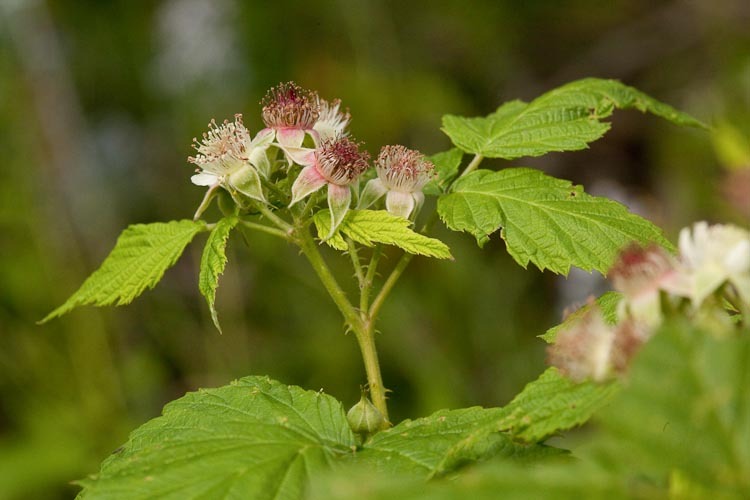 The shrubs collectively known as “brambles” –blackberries and raspberries –are members of the family Rosaceae subfamily Rosoidea that are very annoying to walk among (ouch!). 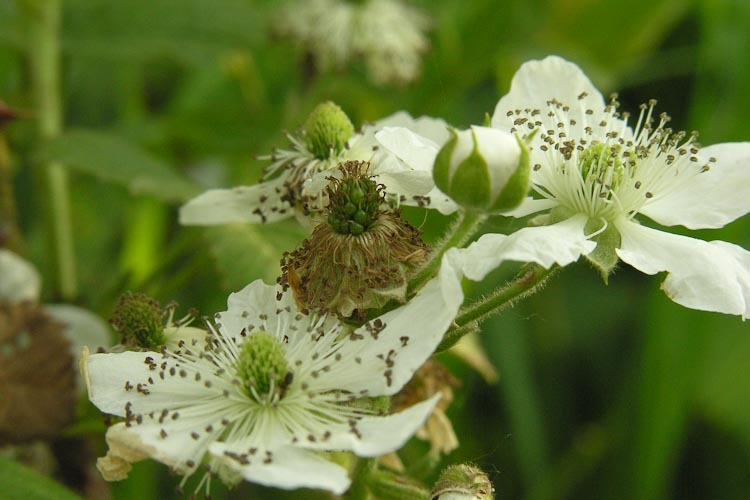 The one shown below is common blackberry, Rubus allegheniensis. 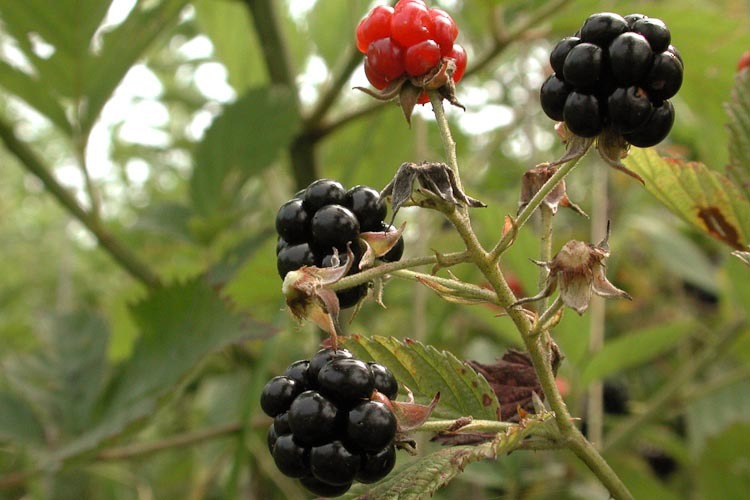 Brambles are perennial shrubs that have biennial canes. Brambles have an interesting growth form. The individual shrubs are perennial, but the stems, called “canes” are biennial, i.e., living for two years. During a cane’s first year it is called a “primocane.” The primocane is vegetative, producing nice big leaves but no flowers. Bramble stem year one: leaves yes; flowers no. 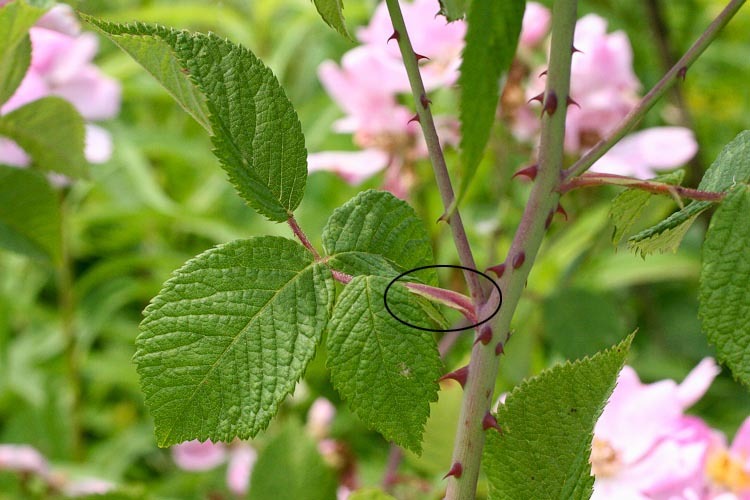 Like many (but not all) members of the rose family, Rubus leaves are stipulate, but the stipules are not persistent. They’re present when the leaves are young, as in the picture below, but the fall off after a few weeks. 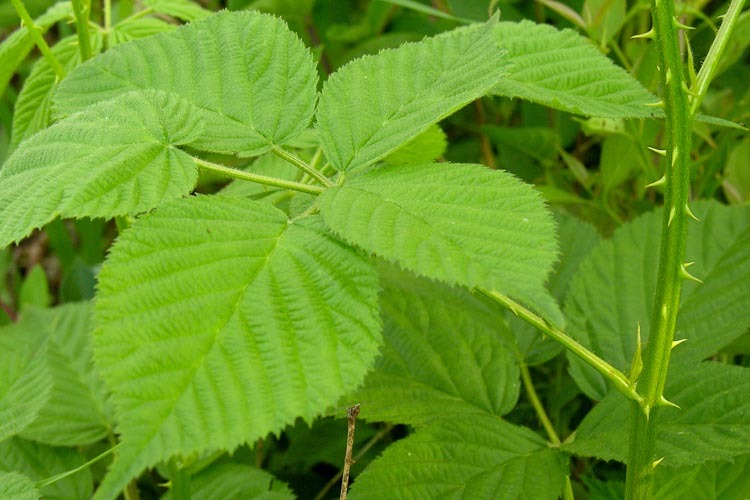 Bramble leaf: palmately compound, with temporary stipules. 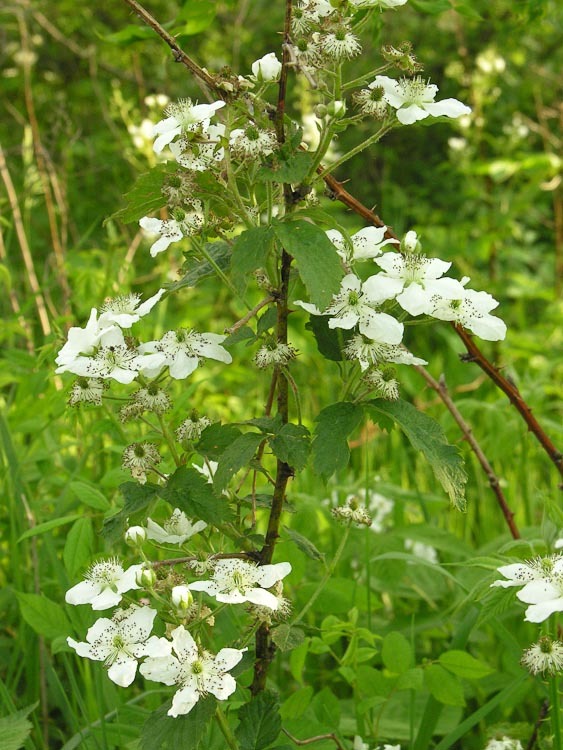 During the bramble stem’s second year it is a “floricane” –a little less leafy, but with flowers and, later, fruits. Bramble stem year two: flowers! 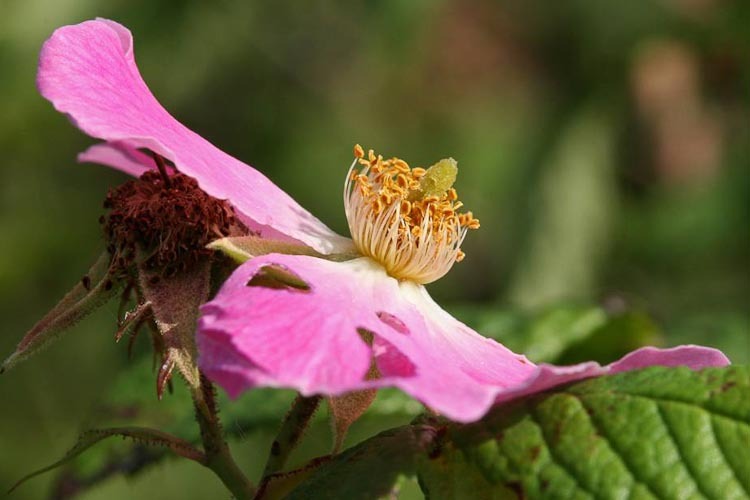 The bramble flowers are fairly typical Rosaceae subfamily Rosoidae: actinomorphic, 5 separate petals, many stamens inserted spirally, and an apocarpous gynoecium of many small carpels spirally inserted on a dome-shaped receptacle. 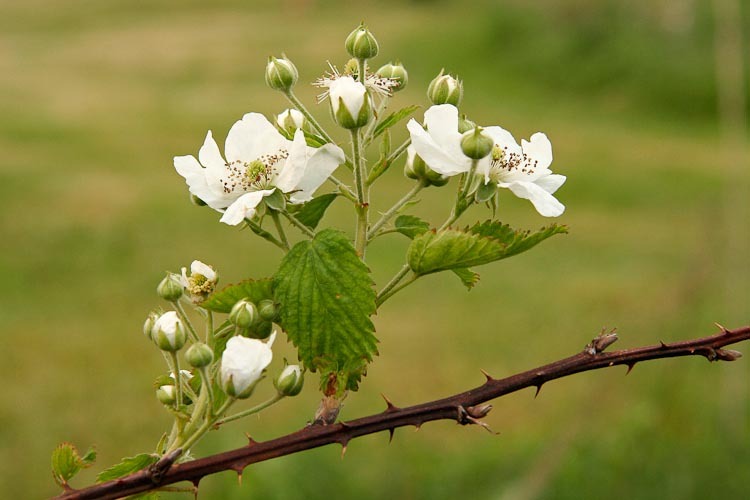 Bramble flowers have an apocarpous gynoecium. Bramble flower has a small but distinct hypanthium. 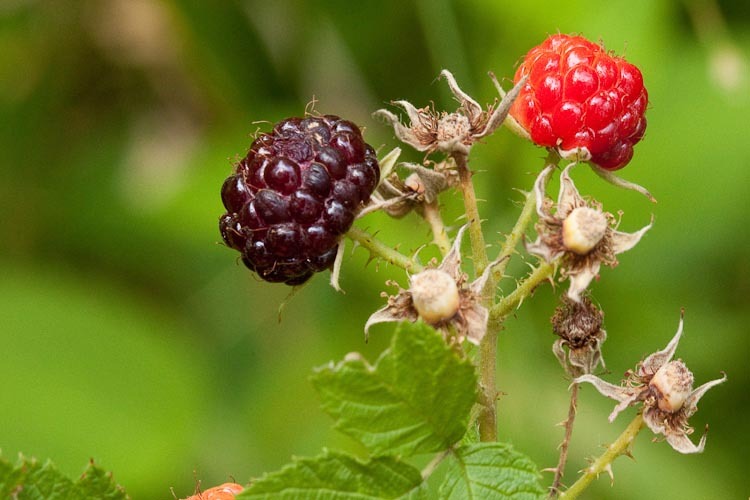 Brambles produce an aggregate fruit that is an aggregate of drupelets. 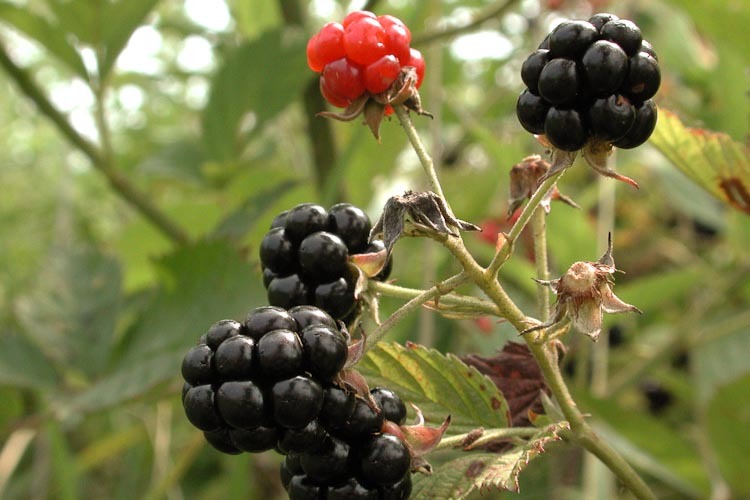 There are two types of brambles (several to many species in each group): blackberries, and raspberries. They are differentiated according to whether the cluster of drupelets, when removed from the plant, carry along the receptacle with them. Blackberries do that, which is why they are filled-in beneath with a mealy whitish material –the receptacle. Blackberries separate from the plant with the receptacle included. Here’s a raspberry, Rubus occidentalis. Raspberries, on the other hand, separate cleanly from the stem, with the receptacle staying on the plant. That’s why raspberries are neat little hollow domes of drupelets. 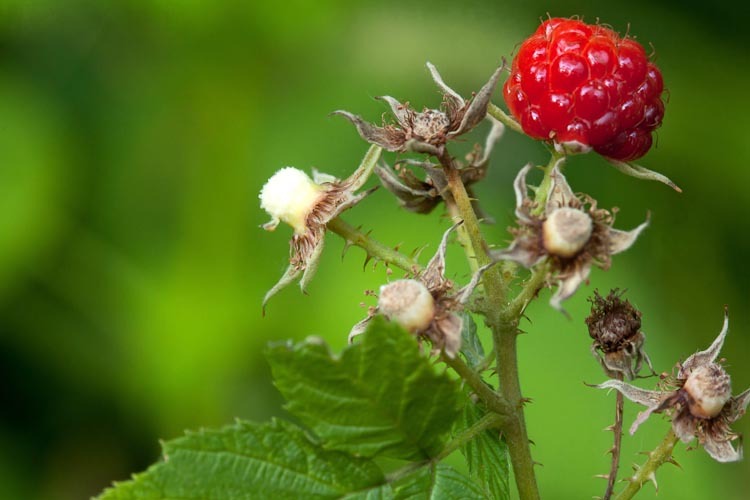 A raspberry separates cleanly from the stem, leaving the receptacle on the plant. Well, I don’t know about you, but I’m getting a bit tired of the subfamily Rosoidae. Can we go on to another subfamily now? Please? OK, let’s do it. How about the …. 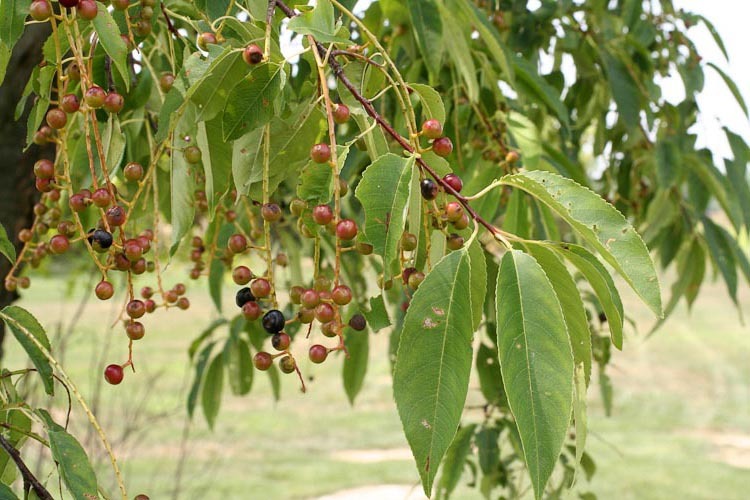 Prunus is the cherry/plum/peach/apricot genus. These are the “stone fruits,” i.e., rose family drupes, defined as having a fleshy outer layer (the exocarp) surrounding a hard bony covering (the endocarp) that in turn covers the single seed. 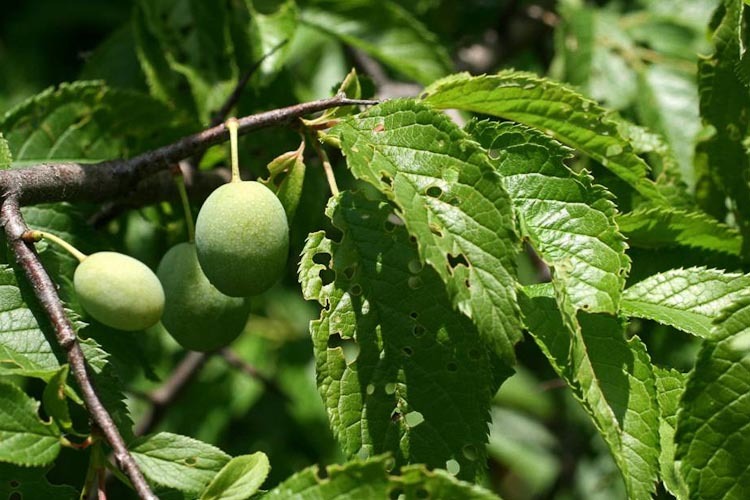 Fun fact: the almond is the seed of another Prunus drupe…it does look sort of like a peach pit, doesn’t it? 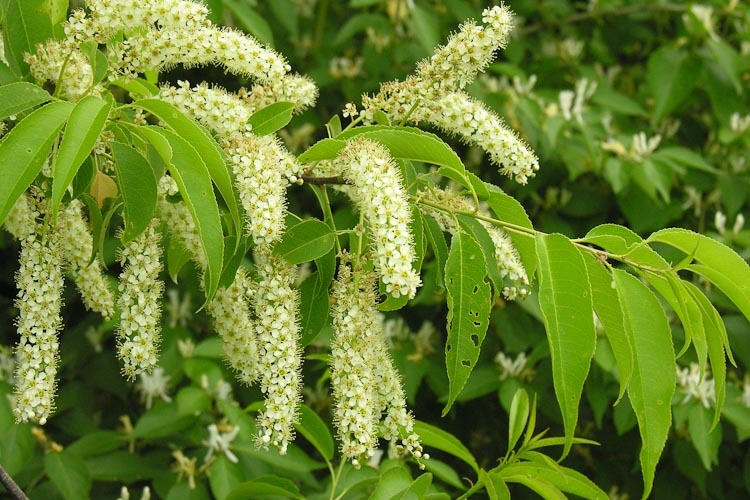 Black cherry, Prunus serotina, is a shade-intolerant forest tree that is often a pioneer in old-field succession. 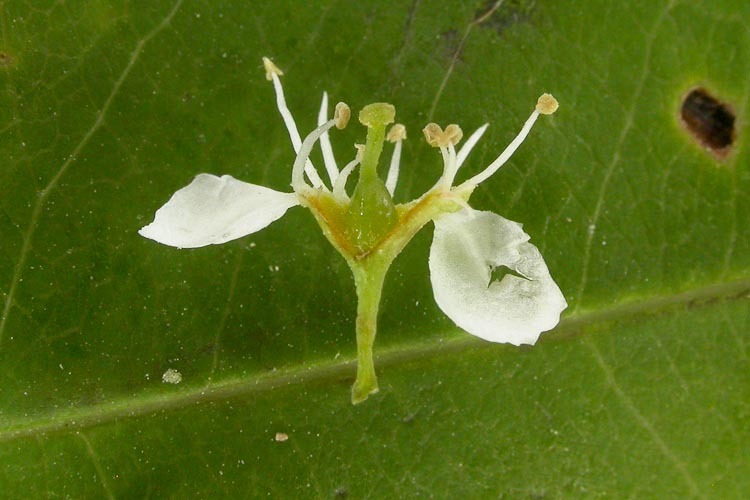 Black cherry produces small flowers arranged in a drooping raceme inflorescence type. 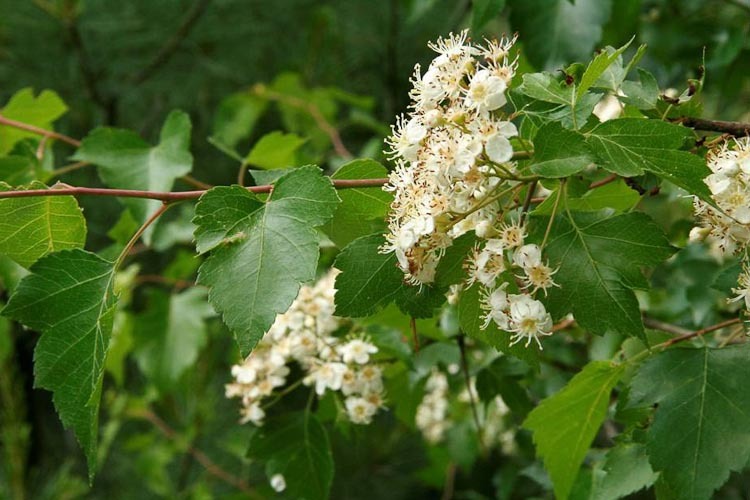 Black cherry is a tree that produces small flowers in drooping racemes. The subfamily Prunoideae has a refreshingly obvious hypanthium: a floral cup that actually looks like a cup! that sits like a teacup around a ping-pong ball (the ovary). 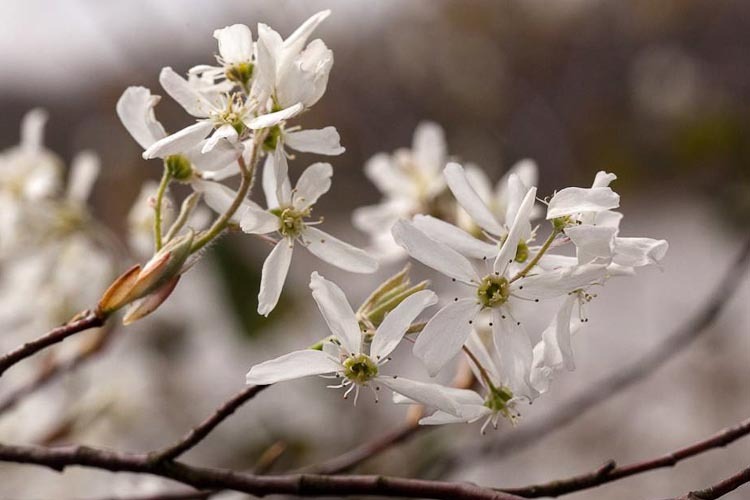 American plum, Prunus americana, is a widespread tree that is the source of some horticultural plum varieties. American plum has especially large drupes. 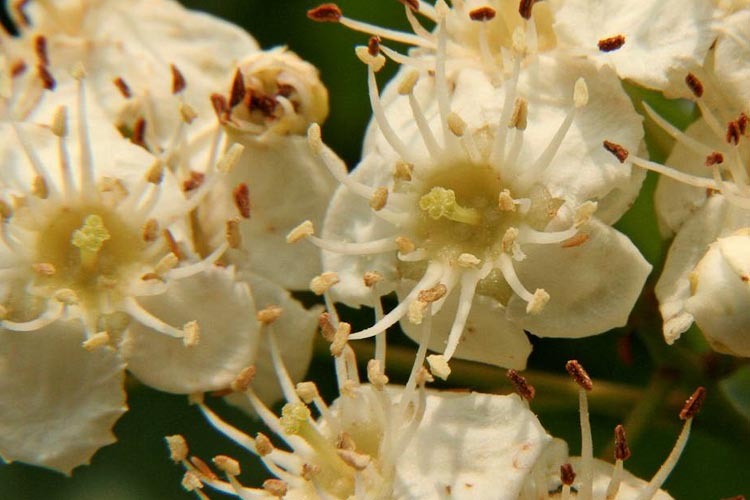 Members of the the spiraea group have several but not very many carpels, each of which matures into a follicle: a several-many-seeded dry fruit that split along a single line or suture. 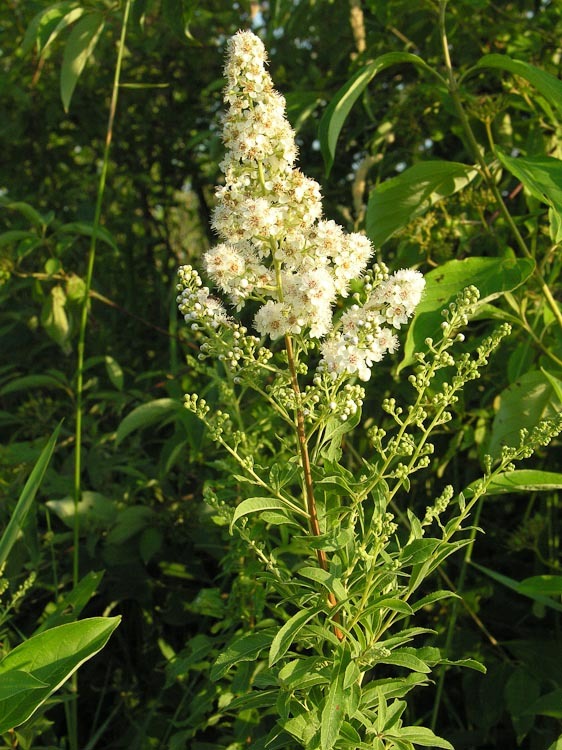 In our area, this subfamily includes a few shrubs of moist to wet prairies or streambanks, the most frequently encountered of which is meadow-sweet, Spiraea alba. 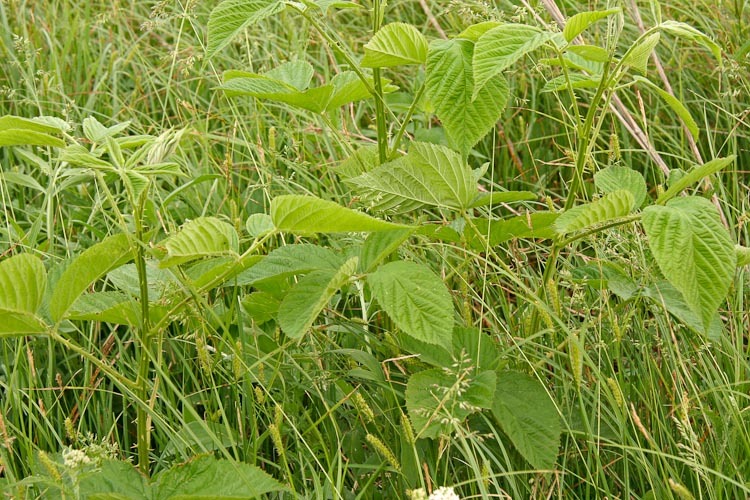 Meadow-sweet is a prairie shrub. very numerous stamens, and five separate carpels. Ninebark is a beautiful shrub that is commonly planted. Q. What did one apple-maggot say to the other apple-maggot? I think that I shall never see, a pome as lovely as a tree. A pome is a unique fruit type, found here only. Th pome is a type of accessory fruit in which the hypanthium of an epigynous (inferior ovary) flower is fleshy and expanded, and the dry and papery ovary –the “core” –is buried deep within it. Members of this subfamily, variously called “Pomoidaea” after the fruit type, or “Maloidaea” after the genus Malus (apples) include apples, crabapples, shrimpapples, lobsterapples, and horseshoe crabapples. Well, maybe not all of those things, but crabapples, anyway. 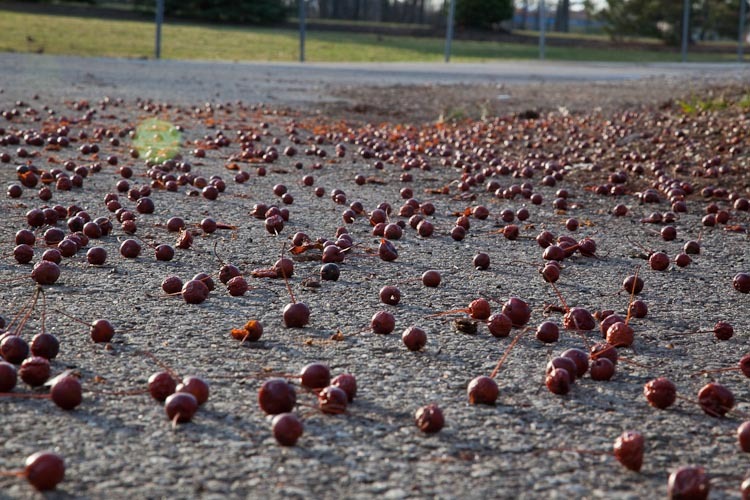 Here’s a picture of a bunch of crabapples on the ground in a parking lot. There’s a lot of stuff that falls off of trees besides leaves, isn’t there? Crabapples on the ground. What a mess! Dirty trees! 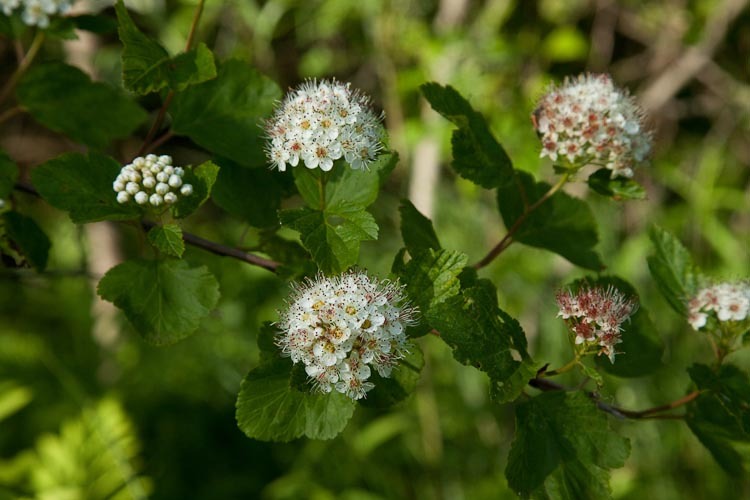 Perhaps the most common pome-forming trees are the hawthorns, genus Crataegus, a taxonomically difficult group of thorny plants, mostly with lobed leaves. Hawthorns (Crataegus) are common thorny trees. 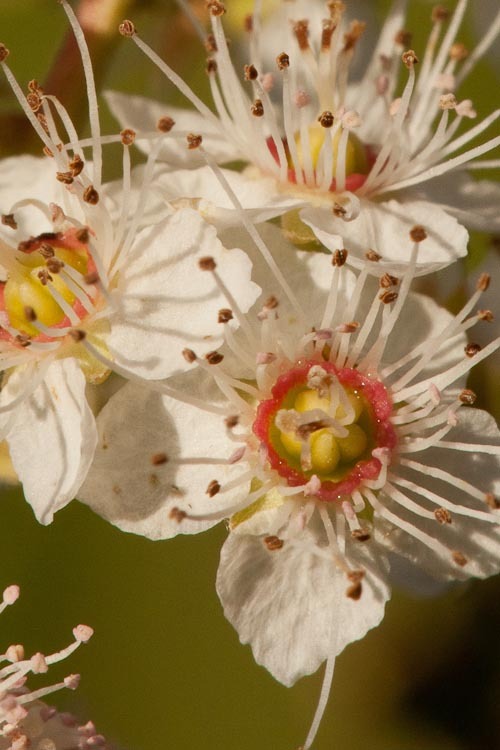 Hawthorn flowers are obviously rosaceous: actinomorphic, with five separate petals, and numerous stamens. The gynoecium, however, is not apocarpous but instead is syncarous, composed of 5 fused carpels. This is evidenced in the photo below by the five styles in the center if each flower. They’re also epigynous, with an inferior ovary (MOUSEOVER). 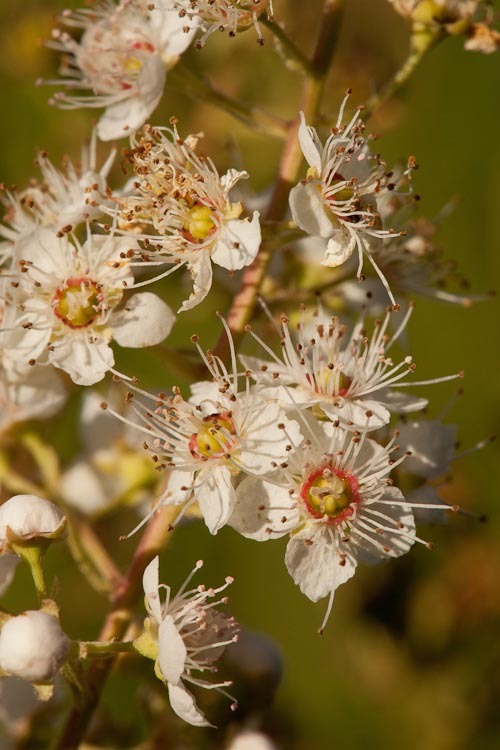 Hawthorn flowers are epigynous, with an inferior ovary. 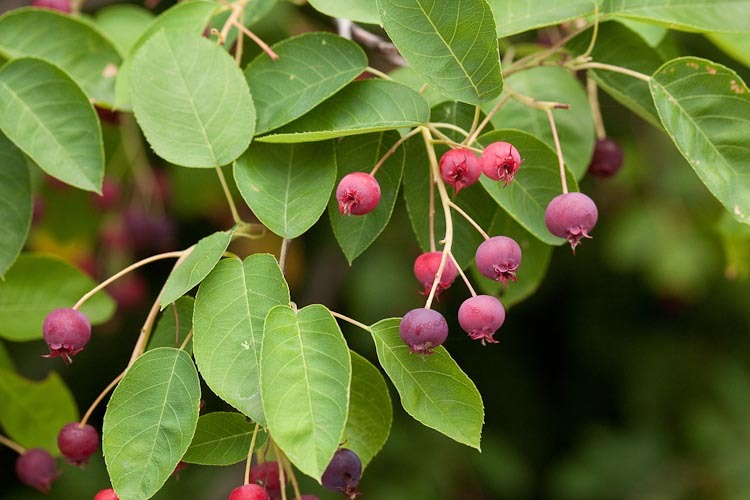 Shadbush, also known as service-berry (genus Amelanchier) is a spring-flowering small tree of woods and woodland edges. 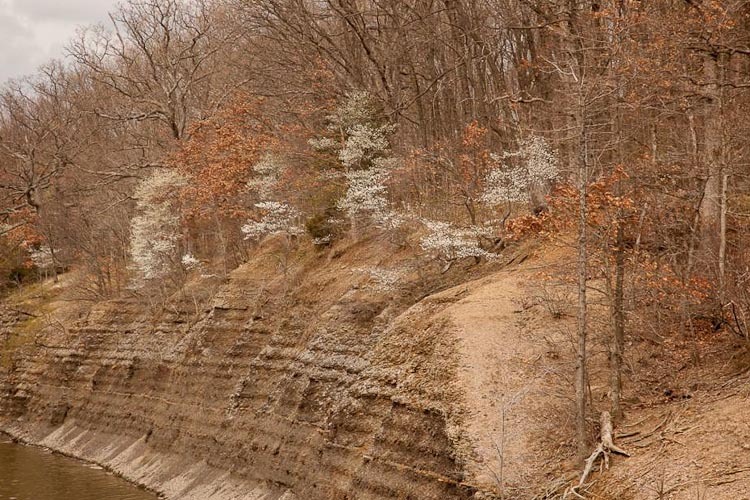 It’s called “shadbush” because shad (fish) are actively spawning during the season of bloom of the trees, and “service-berry” because it flowers early in spring when, since the ground is thawed, it’s time for the burial services for the people who died during the preceding winter when the ground was frozen. Service-berry is an early-blooming tree. 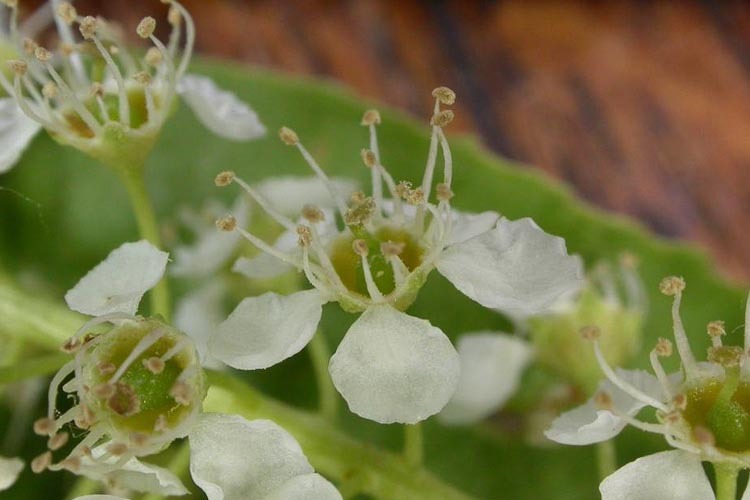 The blossoms of service-berry are actinomorphic, with 5 separate petals, and an inferior ovary. 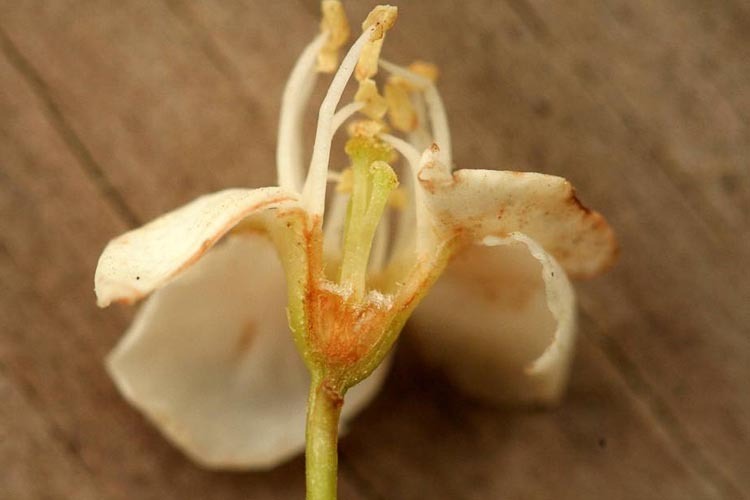 The fruit (SLIDE) is a pome, on which you can see sepals and stamen remnants demarcating a genuine “blossom end,” indicative of a fruit that developed from an inferior ovary. Service-berry flowers are 5-merous, actinomorphic, and epigynous.